Dr. Kathleen Cornely, professor of chemistry, led her department’s efforts in seeking accreditation for the biochemistry program. The Providence College Department of Chemistry and Biochemistry recently joined an exclusive group of schools to earn accreditation by the American Society for Biochemistry and Molecular Biology. With the accreditation of its biochemistry degree program, the department joins a list of less than 70 programs from across the country to earn ASBMB accreditation. The list of schools includes Boston University, Penn State, Purdue, Villanova, and the University of Virginia. • access to an independently constructed and scored instrument for assessing student achievement and program effectiveness. 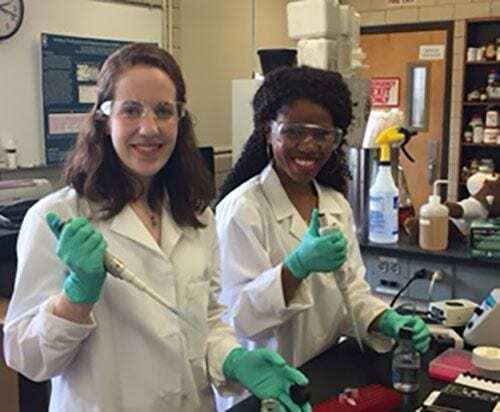 Biochemistry major Amy Conte ’19, left, and Janet Odufunade ’19, a biology major, are research students with Dr. Kathleen Cornely, professor of chemistry. This is the second special accreditation the chemistry and biochemistry department has earned. Currently, the American Chemical Society accredits the department and its bachelor of science degrees in chemistry and biochemistry. In its letter informing the department that it had been accredited, the ASBMB lauded PC for its “impressive culture of scholarship among the faculty” and for having “greater than 80 percent participation of students in mentored research.” Gains in student and faculty diversity and the presence of core courses requiring “inquiry-based” learning also were seen as noteworthy. Dr. Kathleen Cornely, professor of chemistry, took the department lead in seeking ASBMB accreditation. 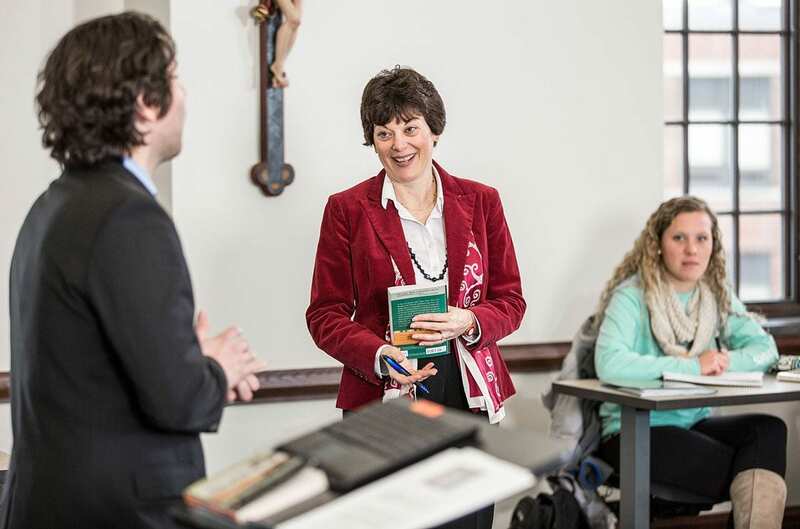 Along with her colleagues, she undertook a lengthy application process that included a department profile (faculty and students), an outline of the College’s curriculum, and examples of research opportunities within the department. While the process was arduous, Cornely believes the benefits of the prestigious accreditation will make the effort worthwhile.